It’s not just the tea that’s brewing in Caryl Churchill’s new play. Beneath the sharing of a nice cuppa, something much nastier is simmering away. While four older women sip from their mugs in a sun-bathed garden, premonitions of catastrophe lurk behind their innocuous chit-chat, breaking through in pitch-black interjections. Over the course of less than an hour, the world ends seven times over: with floods, with disease, with fire. Sugar, anyone? Escaped Alone is a bristling, baffling thing. Running at a brisk 55 minutes, it’s somehow huge and minute all at once. Compared with the formal somersaults of some of Churchill’s previous work, though, the structure is deceptively simple. It’s split into two alternating parts: in one, old friends Sally, Vi and Lena drink tea with neighbour Mrs Jarrett in Sally’s garden; in the other, Mrs Jarrett steps out of the frame of this scenario to deliver bleak missives from humankind’s downfall. Or, as the Royal Court’s blurb pithily puts it: tea and catastrophe. Churchill’s title is borrowed from the Book of Job (“I only am escaped alone to tell thee”), and there is something oddly Biblical about this play, with its visions of apocalypse and its undercurrents of allegory. Linda Bassett’s affable yet enigmatic Mrs Jarrett plays the unlikely harbinger of doom, sent to warn us all of out-of-control, man-made catastrophes. Or perhaps warn is the wrong word, as these various Armageddons are all relayed in the past tense, laced with the bitter tang of inevitability. There is nothing to be done. There are nightmarish touches of brilliance to these imagined disasters. In one, we are told – with characteristically surreal Churchill flair – that “the chemicals leaked through the cracks in the money”. Another conjures a world in which food is siphoned off to television programmes, leaving the general public to starve in front of cookery shows. There’s visceral horror, in images of survivors trapped alone underground and people eating rashers of their own fat, knocking up against inky dark humour – even if the gags do feel a little easy at times, airdropping in wry topical references to selfies and property developers. Churchill is having no less fun in the garden-bound half of the play, in which her female quartet execute scenes of meticulously choreographed gossip. They chat about their grandchildren, about their pasts, about what superpower they’d like to have. This chorus of banalities is all delivered in distinctive Churchill half-sentences, clipped and careful. There’s clearly a shared vocabulary among these old friends. And again it’s rich with terrific moments. In one sequence, the women simply sing The Crystals’ hit “Da Doo Ron Ron” and it’s an absolute joy. Each character also takes their turn to break from the conversation and segue into a strange, disturbing monologue. It’s Sally’s inner voice that startles most, spilling out a breathless and absurd speech about her debilitating phobia of cats. Delivered with mounting intensity by the excellent Deborah Findlay, shoulders rounding protectively while hands nervously flutter, it’s one of the show’s highlights. It’s the join between the play’s two halves that is more troubling – both interestingly and frustratingly so. You could say crisis and tea are never far apart, but otherwise the relationship between garden and apocalypse is left deliberately opaque. James Macdonald’s taut production at once maintains this ambiguity and gestures towards possible links. The small pauses in conversation – subtle and precise – suggest something more beneath the chatter. Miriam Buether’s design, meanwhile, has more than one nod to the void opened up by Mrs Jarrett’s bleak interludes. The garden, overgrown and vivid and lit by a bright, warm glow, is a sort of idyll, but there’s an odd emptiness to the grey-blue skies above that makes it feel as though it could be the last green refuge in the universe. Looked at this way, its contrast with the blackness that engulfs the intervening scenes, intensified by a flickering red neon surround, seems less stark than it first appears. For all that, though, it’s hard sometimes to fight the suspicion that these are simply two interesting scenarios to riff on, and that the whole is given less attention than its (admittedly intriguing) parts. Nonetheless, Escaped Alone is never less than watchable, thanks in huge part to its fantastic cast. 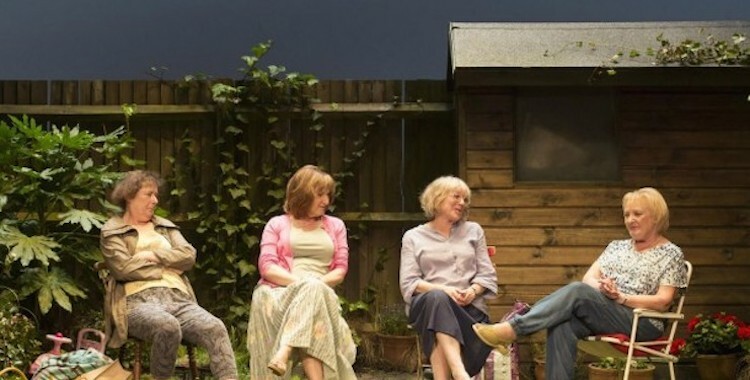 Much has been made of the fact that this is a play for four women in their sixties and seventies – a demographic still seen with shameful rarity on our stages. While the swift running time means that we can only ever get shards of these characters’ personalities, they’re pretty damn fascinating shards, giving the actors plenty to work with. Alongside Bassett’s slippery Mrs Jarrett and Findlay’s cat-fearing Sally, Kika Markham does delicate work as Lena – introverted yet occasionally spiky (“I do get out,” she indignantly insists) – while June Watson peels back surprising layers in unexpected ex-con Vi. If there’s anything that holds the piece together, it’s the incessant, latent fear of the present moment that we live in. The paralysing terror that Sally feels when confronted with the idea of cats and the wilful delusion that has become a coping mechanism (“I have to believe there are no cats. And then briefly the joy of that”) might well stand in for any number of twenty-first century threats: ISIS, climate change, global pandemics. Mrs Jarrett’s catastrophes, meanwhile, are a potent cocktail of ancient fears and very contemporary preoccupations. It can often feel that we are living in the end times – or perhaps just on the brink of them – a feeling that Churchill uncannily captures. This is, to quote REM, the end of the world as we know it. Now then, who wants a cup of tea?